“Toto, I have a feeling we’re not in [Jersey] anymore.” This Jersey girl is definitely far from the Jersey shore these days. The beach I walk along nowadays holds promises of treasures to be found. I walk with my head down, seeking them as a bloodhound who has picked up a scent. I have filled jars and jars of sea glass in a rainbow of colors. I have decorated trays, boxes, and lamps with these tiny jewels, and smile when my eye catches a glimpse of them as I travel from the kitchen to the living room or the bathroom to the bedroom. You see, I have placed them all around me as reminders of what I almost missed…what almost got lost in the details. Can you see the treasures in this photo? Man is like polished stones. It’s inspiring to keep remnants of our journeys close to the sea. Each pepple, shell, drift wood reminds us of the joy we felt during those moments and how blessed we are to experience them. Plus they do make great home accents. Hey! I do exactly that. I have filled so many containers, always meaning to do something more with the pieces of sea glass. I used to collect all coloured glass but got fussy and only pick up white, green or blue and it has to be completely matt and smooth edged. It is treasure. Only problem is I forget to look at the all the wonders around me because my head is down! I like the little heart those two rocks make. I’m not sure I can see the sea glass. I don’t know what it is! Actually, the first thing I saw was the heart. Sea glass followed. I actually didn’t see the heart until you pointed it out. Funny. I count two, possibly three pieces of sea glass. Talk about coincidence too. I was out with my daughter this morning collecting sea glass for a photo idea I have. I also grabbed a bucket of gravel that looks an awful lot like what’s in your photo to use as background. Wow! What a coincidence indeed! I love that your daughter helped you…what wonderful memories she will have. Please share your finished project. I’m excited to see it! I’m not quite sure it came out as well as I’d envisioned, but I’m pretty happy with it. 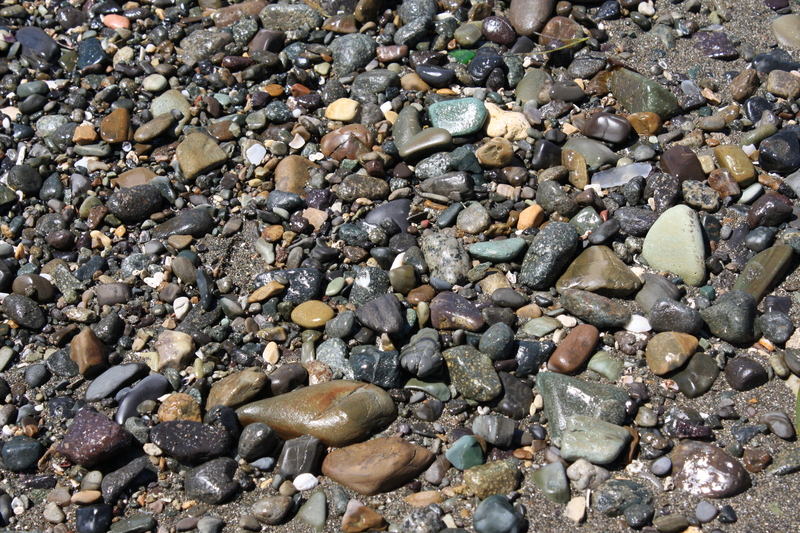 I spot the seaglass…ooh there’s a green one! I always have my nose down when walking the beach. Of course, here in Washington some of it is now coming from Japan. On the coast of Washinton and Oregon about the only fun stones to find are Aggots. I probably misspelled that. They come in a variety of colors, some not recognizable until held up to the light. Of course we also collect smooth shards of glass. Oh how sweet. The beach is one of the places where I am most at peace. I have wonderful memories of it as well. I’m glad I could help you relive some of yours. I love exploring areas, and the beach is a great one for that! Me too, and the beach is definitely one of my favorite places!